Cashing in on V-Day? Take a look at these quirky campaigns! Ah, Valentine’s Day. Who would have thought that the day to honour the patron saint of engaged couples, beekeeping and epilepsy would become such a commercialized modern-day celebration for consciously coupling couples? Never mind the pricey dinners, gifts and flowers; with V-Day spending projected to hit over $18 billion last year in the United States alone, we’d say that yes, February 14 is a pretty big deal. This is the same even in Singapore, where couples are willing to splurge on each other as a show of their affections. Marvel fans rejoice: the ‘Merc with a mouth’ finally gets a title movie to himself, with a cinema release three days before V-Day. In the spirit of all things lovey-dovey, these promotional images were (rather ironically) created for the ‘top movie choice for lovers’ this Valentine’s – never mind that it isn’t really a romantic flick. We hear that a few V-Day dates may have been duped planned around a screening of the flick, thanks to the creativity of the marketers! It’s a stellar choice nonetheless, especially if he/she is a Ryan Reynolds fan… or a fan of ‘hack ‘n slash’ films. Even local cinema operator GV wants to make a romantic date out of a Deadpool screening (because… why not?). The movie’s Twitter account is constantly updated with other great content that’s fun and just as irreverent as Deadpool is – our personal favourite is this reference to the survival drama film 127 Hours. BooksActually: Flowers are Cliche, Say it with Books instead! Not quite quirky as it is rather novel: local gem of a bookstore BooksActually has offered up a literary alternative to the usual Valentine’s gifts, curating special book baskets to be sold only over the V-Day weekend. Because if words aren’t quite your thing, why not let other writers say it for you? While traditional images of the love messenger show a near-naked curly haired cherub with a bow and arrow, Porta Nova brings Cupid back to earth with a modern, manly twist. In this promotional video for their Valentine’s Day campaign, the ‘Command Cupid’, armed with a periscope-looking bow (with an in-built camera and smartphone), will roam the streets of Paris and Berlin on February 14 to facilitate ‘love at first digital sight’. See someone you fancy? Let Cupid know: he’ll hand them a rose on your behalf, and you can catch their reaction (and maybe a flying kiss?) on the Periscope app. While we wouldn’t mind a ‘wingman’ like that, we’d be more than happy to hand Cupid a rose as well! 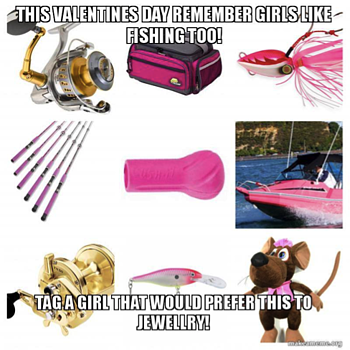 IFISH Tackleworld: Nothing says ‘I Love You’ more than a new Fishing Rod! Thinking of doing something different for your Valentine? Why not name your significant other after a roach? This Valentine’s Day, the Bronx Zoo in New York is offering this very unique opportunity – for just US$10 (S$14), your beloved receives a digital certificate (to prove its authenticity), while US$25 (S$35) will get him or her both the digital certificate, and a sweet treat from a Brooklyn confectionery (this option has since sold out). Aside from being a quirky way for your other half to ‘know your love is eternal’, it also goes towards a good cause: the protection and upkeep of the animals at the zoo. In paraphrasing the immortal words of Beyonce, if you like ‘em, you should put a name on ‘em. Or, really, you could just say it with fake flowers. All that said and any cynicism aside, let February 14 also be a day to show love and appreciation to those around you, not just your significant other. Because honestly, every day should be Valentine’s Day when you’re together. If you’re not ‘consciously coupled’ at the moment, don’t despair – break the cliché and give yourself a treat instead. Happy Valentine’s from all of us at akïn! Michelle holds the literary fort of AKÏN’s Content Production. 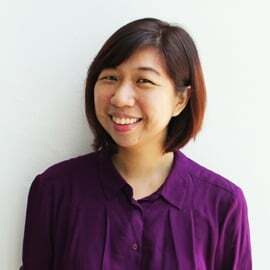 As the resident wordsmith, she is tasked with bringing brands' messages and personalities to life, giving them a voice through punchy taglines, spot-on write-ups and witty one-liners. She believes in the power of the written word, which is even more formidable when grammatically sound. Michelle is an English and Creative Arts alumnus of Murdoch University (Perth, Western Australia). Her passion for communication transcends beyond the office onto the stage, where she freelances as an emcee for events, gigs and weddings. When she's not being AKÏN to anyone, she can also be found at concerts, the library, vintage shops, or at the doggy pool with her senior canine, Dusty.